this summer i have been a little slower reading because we’ve been too busy playing and having fun in the sun. here’s a little snapshot of my last ten books i’ve read. i’m hoping this fall is going to be slow and steady so i can speed up my reading pace! i’m sure it will be though, summer always seems to be the busiest! 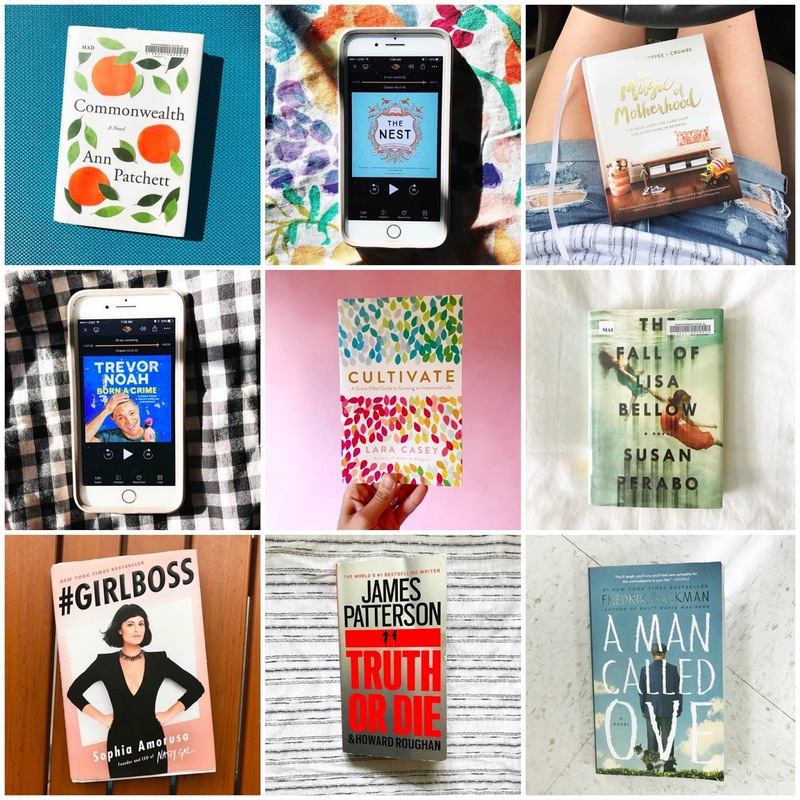 i included a few of the books i have on my to-read list too at the bottom of this post! commonwealth by ann patchett a story about love and loss and how time can be such a thief. this book may be in my top five of the year. it was so so good! i can’t wait to read more of ann patchett’s writing! born a crime by trevor noah this book was something i normally wouldn’t have picked up but this story of trevor’s life was so good and truly laugh out loud funny. i’m so glad my friend recommended it to me! the nest by cynthia d’aprix sweeney i started and stopped this book numerous times last year but i finally decided to give it another shot. i listened to it on audible so it could get confusing if you weren’t paying attention because of how many characters there were but once you figured out who everybody was, it got super good! the magic of motherhood by ashley gadd every chapter in this book was a different story. about motherhood, faith, adoption, body image, and everything else our hearts feel as mothers (and women really). it was like sitting with best friends at a coffee shop chatting and nodding yes because you understand exactly what that person is going through. so so good. truth or die by james patterson i always love a good mystery novel that reads fast and james patterson never disappoints. hillbilly elegy by j. d. vance another memoir that intrigued me. i didn’t know much about the hillbilly type lifestyle but j.d. vance sheds a lot of light on how he grew up. it wasn’t one of my favorite books but i still enjoy it! probably a three star. the fall of lisa bellow by susan perabo this book was slightly disappointing because there wasn’t much of an ending. it’s about a girl who goes missing and the story is told from numerous perspectives so i appreciated that but it the book is just sort of over and it leaves you hanging. i’m still glad i read it though because what happens in the book could absolutely happen to anyone in real life. cultivate by lara casey if you follow me on instagram, you saw i was lucky enough to be a part of the book launch team for this book and read it before it came out. the lord knew i needed this book and put it in my hands at the right time. it’s a story of how god stepped in during some of the author’s hardest times. the pages are filled with topics that can be uncomfortable and make you think to questions that really makes you contemplate what you want in your one life. i already know i’ll be reading this book over and over in years to come because i know my answers will always be different depending on where i am in life. a man called ove by fredrik hackman a story about a man who doesn’t feel like there’s much to live for anymore since his wife passes but other people intervene and feel otherwise. a man called ove started off a little slow but once i got past the first few chapters i couldn’t stop listening. it’s incredible how much this books shows what kind of impact you can have on others. up next on my reading list is here comes the sun, simplicity parenting, no drama discipline and all the light we cannot see. have you read anything good lately? i’m always looking to add new books to my list! Those look like some great books! I need to find some time to read, whenever I do, I'll definitely reference back to this post! I loved Girlboss! and the magic of motherhood sounds great! I will have to check it out! Oh my gosh, I'm so jealous of all your great reads! I use to read a book or two a week and sadly I haven't had much time for it lately. Hoping to get back into it soon! I really need to pick back up reading. I love it so much and there are so many great books I've got on my list. I loved #Girlboss her story is crazy and so amazing! I have heard of some of these but haven't read any yet. I've been trying to figure out what to read next so I appreciate your great recommendations! Thanks!